The 2014 BBC Children in Need Rickshaw Challenge is underway! ViewRanger is delighted to be supporting The One Show’s Rickshaw Challenge for BBC Children in Need for the fourth consecutive year. The first leg of the 8-day Rickshaw Challenge is now underway, having left Media City Salford earlier this morning, with Blackpool being the first port of call. Team Rickshaw are six young people, each supported by projects funded by BBC Children in Need, who will power the rickshaw for more than 450 miles across England. This year the rickshaw will be pedalled solely by the young riders, although The One Show presenters Matt Baker and Alex Jones will be offering their support and advice, both from the studio and live on the road as they cycle alongside the team. Now in its fourth year and having raised over £5m in total, the team is hoping to smash previous records with the best year of fundraising yet. ViewRanger has provided the rickshaw team with with smartphones, preloaded with the ViewRanger app and Ordnance Survey maps, to help them stay on track - and for others to track their progress live - throughout the arduous journey across England. 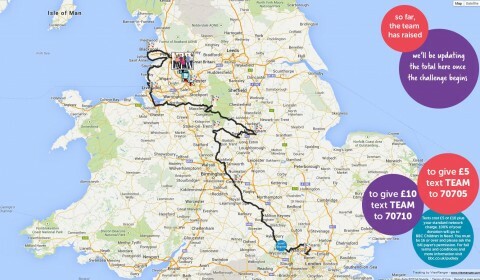 Friends, family and supporters can follow the team’s live progress online, via the BBC Children in Need website or http://pudsey.viewranger.com/ as they travel from the BBC’s Media City in Salford, near Manchester, to the finish in London on Friday 14 November. 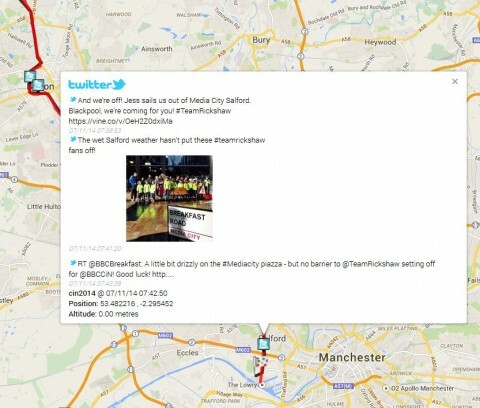 The rickshaw is being tracked using ViewRanger's BuddyBeacon function, which provides location information to the website, allowing local supporters also be able to see when the team will arrive in their area and be there in person to cheer them on. All the tweets and photos sent to the rickshawers will also appear on the route map, tagged to the route, so it's a great way to keep up to date with the Rickshawers' progress and message of support. The Rickshaw Challenge is one of the many different activites going on across the country to raise money for Children in Need. You can show your support for Children in Need by donating £5 or £10 by text message - it's very easy! We also recommend that everyone who can goes out to cheer on Pudsey and the rickshaw team! Keep an eye on the live rickshaw location map to see where they are.